Well, colour me impressed - HMV, a CD and DVD retail chain store in Canada, has launched an online music store. We had a few of them already, but most were re-branded and based on Puretracks on the back end, and up until recently that meant DRM-laden WMA files. Puretracks has been transitioning over to MP3s, but I find their store cumbersome to use. 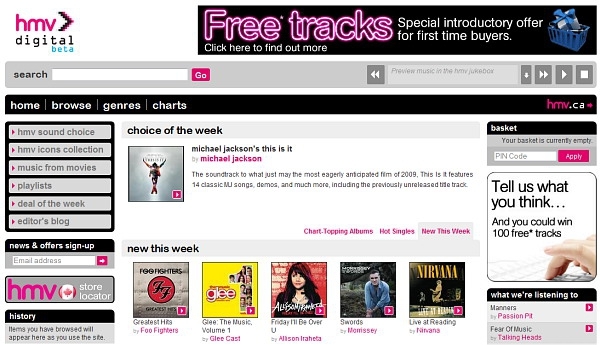 HMV Digital on the other hand, reminds me a lot of Amazon.com's MP3 store - fast, fluid, and simple. The music is in 320kbps MP3 format, which is excellent, and most tracks are 99 cents with a few in the $1.29 range. Albums are in the $9.99 range, and you don't even have to install a downloader if you don't want to - the albums come down in a single ZIP file. And best of all? They allow you to re-download your purchases up to five times, so if you happen to have a data wipe-out, you can get your music from them again. I'm not sure how deep their catalogue goes, but for new releases, this is where I'm going to be doing my shopping. Nicely done HMV!